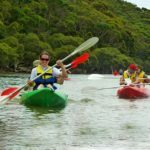 Glenworth Valley Quad Biking Tour, Central Coast: Quad biking offers a fun time for family and friends to get together and enjoy. 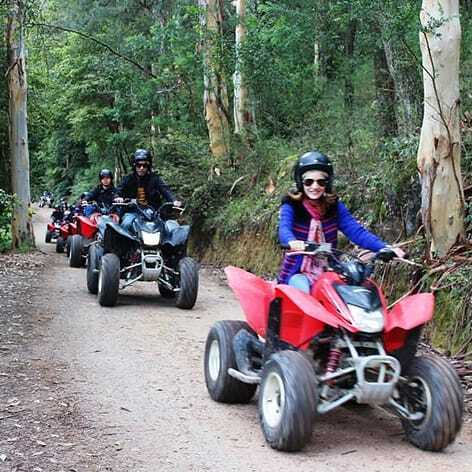 This 90 minute Glenworth Valley Quad Biking Tour is only an hour north of Sydney and only minutes from Gosford. 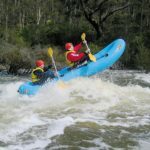 It is a great way to explore the Australian bush, and Glenworth Valley has plenty of that to explore! You are in control of your very own four wheeled fun machine, a Honda TRX250EX quad bike. Imagine riding a quad bike with your friends through the Australian bush on a purpose built quad biking track. Quad biking on a four wheel ATV is awesome fun and surprisingly easy to use. In fact, no experience is necessary and anyone 12 years and above can do it. All our bikes are fully automatic making them easy to ride and use. This quad bike tour is fantastic fun for family and friends, group outings for social organisations and corporate team building activities. 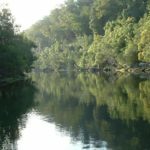 Why not pack a picnic or enjoy a BBQ lunch on the banks of Popran Creek and enjoy the day at Glenworth Valley. Quad bike rides depart at 10am, 11.30am, 2pm and 3.30pm - subject to an advance booking. Please ensure you arrive no later than 15 minutes prior to your scheduled departure time. All rides last for 1.5 hours duration and you can expect to cover at least 15 kms of terrain during your ride. Please ensure you wear t-shirt, long pants, sunglasses and enclosed shoes. No singlets, thongs or slip on shoes are permitted. Wear clothes that you don't mind getting dusty or bring a change of clothes with you just in case. Coveralls and bandanas may be purchased on the day if you wish. Bring wet weather gear if the weather is a bit uncertain. Something warm to wear during the winter months. Ages 12–18 years must have written parental consent in order to participate. Children will be required to ride their own quad bike. No drugs or alcohol should be consumed on the day of your experience. Minimum of 4 participants required for a tour to proceed on a weekend, or minimum of 2 participants required for a tour to proceed on a weekday. You will be required to provide a security deposit prior to participating in the activity. All riders need to pass our assessment test to qualify to go out on our rides. A 50% refund applies to any rider who fails our assessment test.